Hey everybody, welcome back to my blog. Today's topic is a fun one. I'm going to be answering some of the most common questions I've been getting lately from my clients. You've probably asked a lot of these questions yourself, so today I am going to provide some answers. "Can you take me through the home-selling process and tell me what to expect?" Over the years, I've recognized a number of steps it takes to sell a home, and for the purposes of this video, I'll go over the key steps with you today. I can take you from anywhere you are in the process all the way through to closing. Step 1 is the initial conversation you have with a Realtor, where you discuss your goals in regards to your home sale. Step 2 is actually seeing the home, which includes doing a walk-through, discussing pricing, and going over any changes you can make to help increase your value. When we're ready to proceed, we will schedule photography and from there, buyer showings will start within a few days. "When Can I expect an offer?" The average market time in our area is 90 days, but my team's average is 39 days. We are doing the job in less than half the time. "How much can I expect of my listed price?" 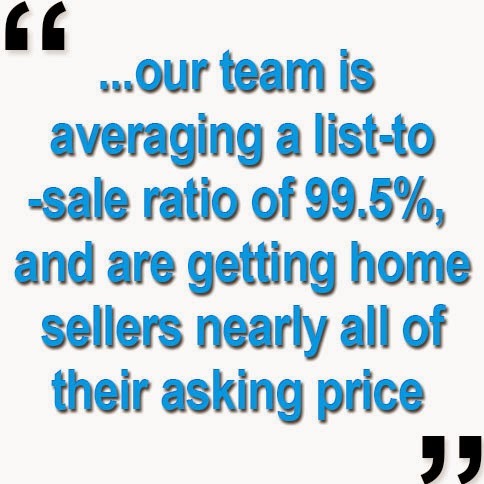 The average Realtor is only getting 92% of their list price. So if you list for $500,000, you can only expect $460,000 back. 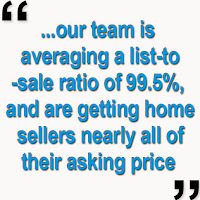 However, our team is averaging a list-to-sale ratio of 99.5%, and are getting home sellers nearly all of their asking price. Our clients have been very happy about that. "How long does it take to get to closing?" Usually about 30-35 days on average, although if you need to move faster or slower, we can help you do that. If you have any questions for us, feel free to give us a call or send us an email. If you know somebody who is looking to buy or sell, share this video on their Facebook timeline! We look forward to hearing from you soon! What Can You Expect from Interest Rates in 2015?